Ing "Juneau" lilipat ya keni. Para keng aliwang gamit, lawen ye ing Juneau (disambiguation). 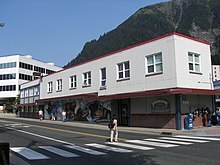 Ing Lakanbalen ampong Borough ning Juneau (mayayagkas /ˈdʒuːnoʊ/) metung yang piabeng municipalidad atiu king Gastineau Channel king panhandle na ning U.S. state ning Alaska. Iti ing kabisera (tungku) ning Alaska manibat 1906, iniang ing gubiernu na ning kanitang-Distritu ning Alaska mialis ya manibat Sitka agpang keng dicta na ning U.S. Congress iniang 1900. Ing municipalidad piabe de iniang 1970 iniang ing lakanbalen ning Juneau miabe ya keng lakanbalen ning Douglas ampo ing makapadurut a Keragulan Juneau Borough para itatag de ing kasalungsungan a municpalidad a manungkulan. Fourth Street downtown, makalawe keng aslagan ibat keng arap ning Alaska State Capitol. A very popular destination is Mendenhall Glacier. A bridge connects Douglas Island with the rest of Juneau, and there are about five places where roads end. Float planes and helicopters offer glacier tours in summer. Dog sled rides are often given to tourists landing on the glaciers or ice caps. Other companies offer boat rides. One of the signature places in Juneau is The Mount Roberts Tramway, an aerial tramway stretching from a station on the cruise ship docks to a point on the southwestern ridge of Mount Roberts. Andrews, C.L. (1944). The Story of Alaska. The Caxton Printers, Ltd., Caldwell, Ohio. Naske, Claus-M and Herman E. Slotnick (1987). Alaska: A History of the 49th State. University of Oklahoma Press, Norman, Oklahoma. ISBN 0-8061-2099-1. ↑ nnual Estimates of the Resident Population for Incorporated Places in Alaska, Listed Alphabetically: April 1, 2000 to July 1, 2008 (CSV). 2008 Population Estimates. U.S. Census Bureau, Population Division (July 1, 2009). Retrieved on July 27, 2009.